China and Japan’s deputy foreign ministers met in Tokyo on Thursday to hold the two countries’ first bilateral security dialogue in over four years. Vice Foreign Minister Liu Jianchao led the Chinese delegation, with Japanese Deputy Foreign Minister Shinsuke Sugiyama representing Japan. Unnamed senior defense ministry officials from both sides were also reportedly present. That the talks were held at all can be considered a breakthrough. Japan and China last held designated security talks in January 2011, before the relationship soured in 2012 in the wake of Japan’s decision to nationalize the disputed Senkaku/Diaoyu Islands. The territorial dispute is only the tip of the iceberg, however; at heart, both countries deeply distrust each other’s motivations for shoring up military forces. As expected, Thursday’s talks saw little concrete progress on actually dealing with the entrenched security issues that divide Beijing and Tokyo. The one area ripe for deliverables – the creation of a communication mechanism for encounters at sea and in the air – didn’t progress as far as hoped. According to Reuters, the two sides failed to agree on a timeline for the mechanism, although both China and Japan reaffirmed their commitment to completing the deal. During the talks, China’s delegation repeated often-raised concerns over Japan’s defense reforms. Xinhua quoted the delegation as asking Japan to return to a “purely defensive defense” strategy, rather than the “proactive pacifism” favored by Prime Minister Shinzo Abe (which will see Japan increasingly involved in regional and global security). Japan, for its part, responded by citing its own concerns over a lack of transparency in China’s military buildup. Japan’s delegation also suggested that increased exchanges and dialogues will help shore up mutual trust and reassure each side of the other’s intentions. “There still are concerns over each other’s security policy… The best way to dissolve the concerns is to hold direct dialogue,” Sugiyama said, according to Japan Times. Accordingly, both sides have committed to carrying forward with future security dialogues and even security cooperation. China and Japan both expressed their hope of holding such talks annually. Both Liu and Sugiyama agreed that China-Japan relations have improved noticeably since last year, when the two sides released a joint four-point consensus prior to the first in-person meeting between Abe and Chinese President Xi Jinping. The next step will be a trilateral summit between the foreign ministers of China, Japan, and South Korea, to be held March 21 in Seoul. According to Japanese Foreign Minister Fumio Kishida, he will also hold bilateral talks with his Chinese and Korean counterparts on the sidelines of the main meeting. The trilateral dialogue, Kishida said, will focus on current and future “cooperative projects” involving all three countries. 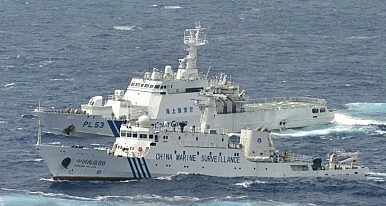 Historical issues and maritime disputes continue to strain relations between China and Japan.